$5,000 preferred lender incentive! Move in ready! Brand new construction. Open floor with modern finishes. Quartz counter tops in kitchen and baths. Beautifully designed kitchen with large entertaining island and stainless steel appliances. Gas fireplace in great room. Master suite features walk-in closet, large master bath with two sinks, walk shower with seat and raised vanity.Soaking tub featured in secondary bath. 75 gallon hot water heater and A/C standard. Visit our website for a walk through tour at www.prairiewalkcc.com. 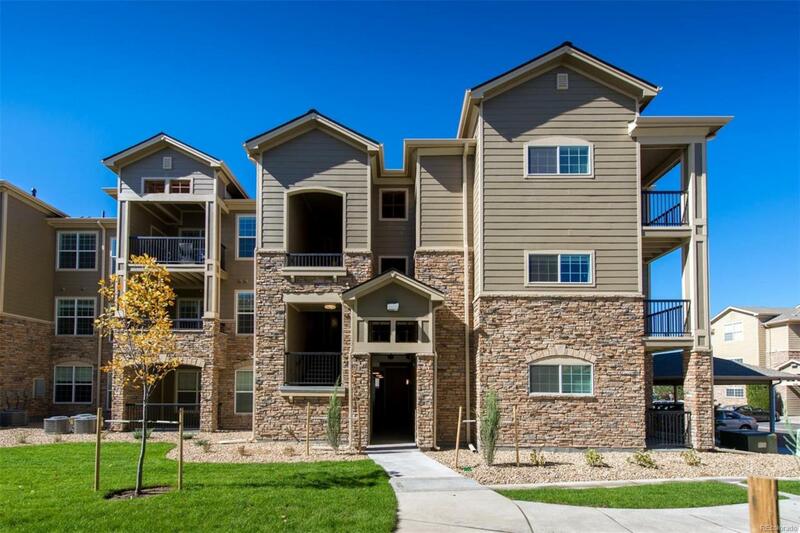 Established community, conveniently located at Jordan Rd and E470 for an easy commute. Amenities include clubhouse, fitness center (24/7 access), outdoor swimming pool, hot tub, volleyball court and amazing access to Cherry Creek trail. Broker must accompany buyer on 1st visit. Taxes for completed units are not assessed, tax amount is an estimate only. Pictures are of B floorplan Don't miss this opportunity to own a brand new condo!